With a bit of inspiration and planning, you can enjoy the outdoors from spring through fall in your own backyard getaway. An outdoor kitchen is the perfect setting for dining al fresco on the first warm weekend of the year, and a warm fire pit is the best way to enjoy the crisp air of late fall.  From granite patios and outdoor kitchen countertops to DIY fire pits and outdoor fireplaces, your local Swenson Granite Works store can help you elevate the livability of your own outdoor retreat. The options are nearly endless when designing a livable backyard, even with a limited budget or space available. From lively areas where kids and adults alike can play games to secluded sanctuaries for reading and quiet enjoyment, outdoor livability can be achieved in almost any setting. “Outdoor rooms make your home feel more spacious and create designated areas that enhance the enjoyment of your property,” according to HGTV. Taking inside elements outdoors, like comfortable seating or a crackling fireplace, can make an outdoor area feel like a comfortable extension of your home. These essentials will increase the livability of your outdoor retreat and make you feel like you’re on staycation every day. 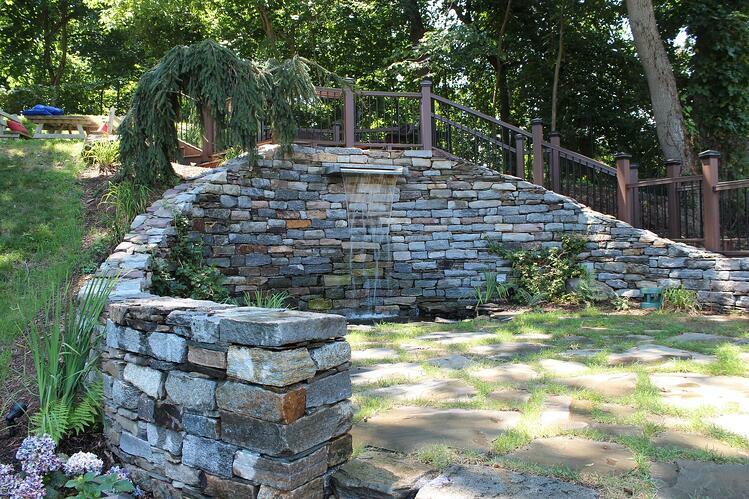 Stone walls add dimension, visual interest, and functionality to any outdoor space. They can either divide a backyard into upper and lower levels or create separate outdoor “rooms”. A home in Hollis, New Hampshire features a stone wall with Boston Blend ledgestone thin veneer and thermal top Woodbury Gray granite wall caps. Woodbury Gray granite split face steps lead down to the lower level. Project by Northern Lights Landscape Contractors. Stone walls can serve a functional purpose as well as a visual one. 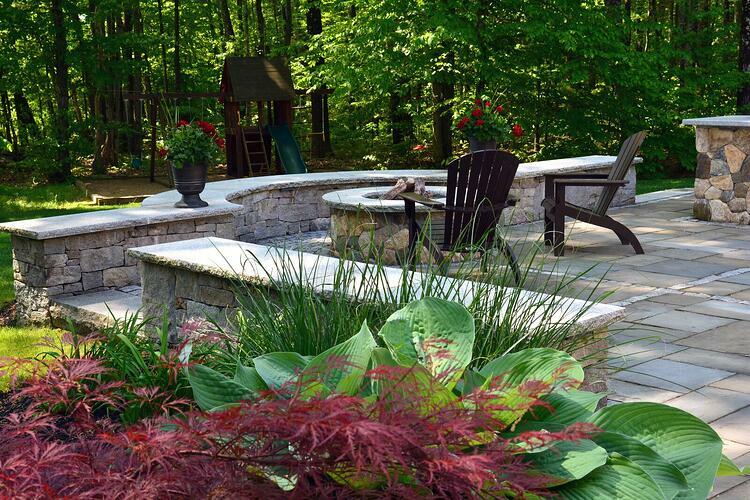 Low retaining walls can double as extra seating or accentuate softscape features like flowers and shrubs. 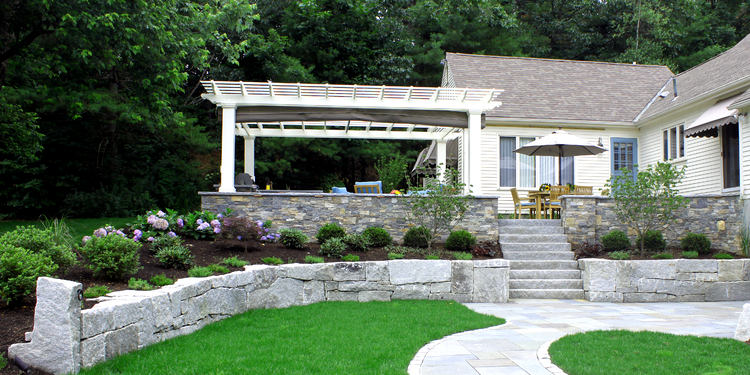 Stone walls create a border around an outdoor dining area at this Milford, New Hampshire home. The wall stone is a blend of Boston Blend thin veneer, ledgestone and mosaic with a Woodbury Gray granite cap. 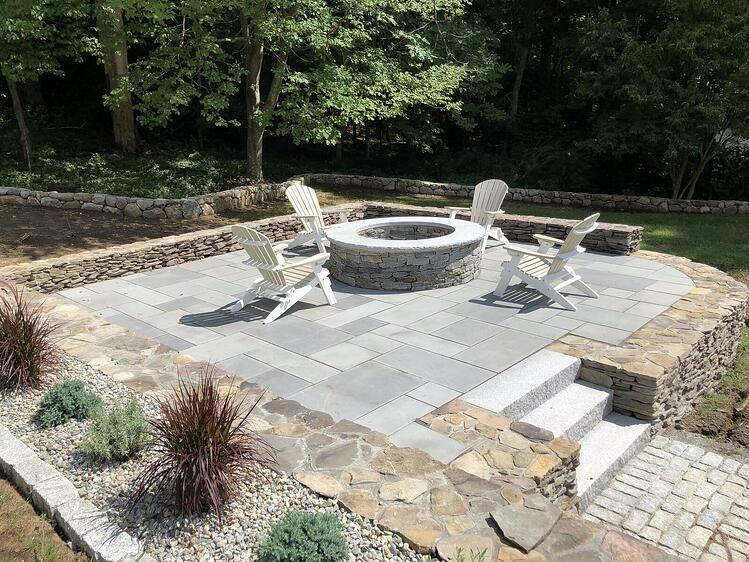 The patio stone is full color natural cleft bluestone. Project by Northern Lights Landscape Contractors. The stone wall can provide extra seating or table space during large gatherings. there are few better places to cook, relax and gather than an outdoor kitchen during warmer months. 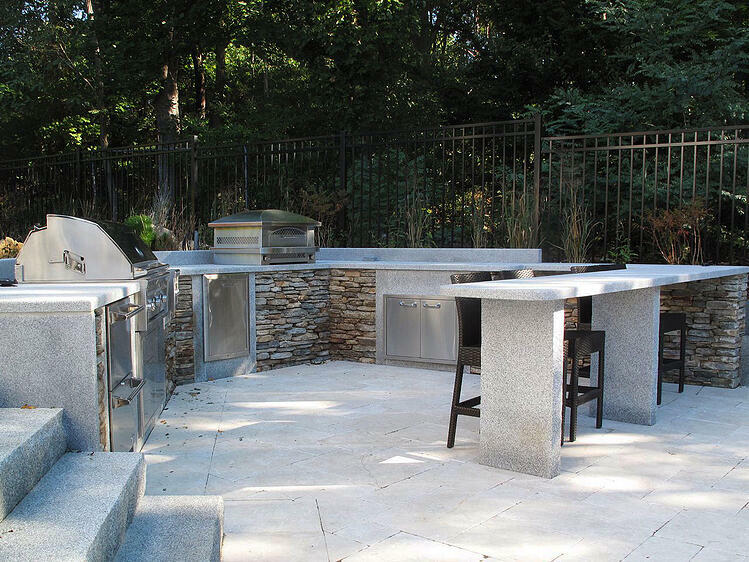 Luxury outdoor kitchens can feature everything from refrigerators to custom pizza ovens, but a beautiful and livable outdoor kitchen is attainable at almost any budget. While a beautiful grill or oven can be the focal point of an outdoor kitchen and dining area, the surrounding appliances and features are just as critical in creating a livable space. 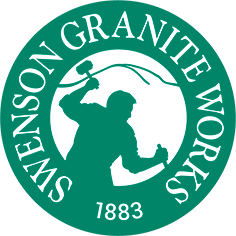 Discover how Swenson can help you create the ultimate outdoor kitchen with natural stone veneer and countertops. In this sunny Rhode Island backyard patio, the sandblasted Woodbury Gray granite countertop, Connecticut Blend Ledge thin veneer, and Woodbury Gray granite pavers work in harmony with appliances and natural elements. Project by Magma Design Group. 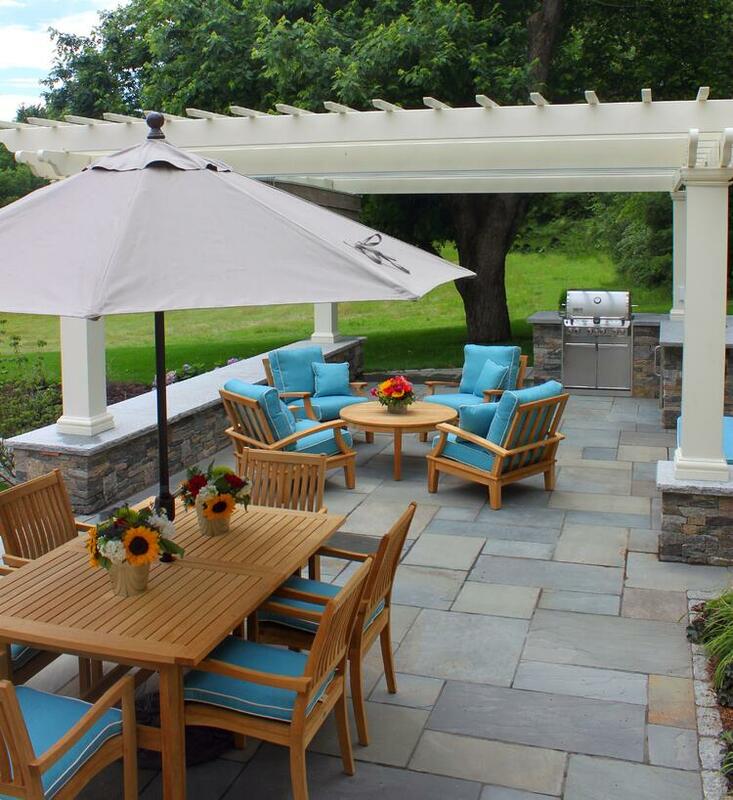 Overhead structures like gazebos, pergolas, and screened porches can create a charming aesthetic while providing shelter from sun, rain, and other elements throughout the year. “An overhead structure (also) allows for extras like ceiling fans that make the space comfortable,” says HGTV. Boston Blend ledgestone thin veneer gives the walls of this Hollis, New Hampshire outdoor kitchen a natural aesthetic. Both the wall caps and countertop are made of 2” thermal top Woodbury Gray granite. The patio is full color natural cleft bluestone with cobblestone edging. Project by Northern Lights Landscape Contractors. 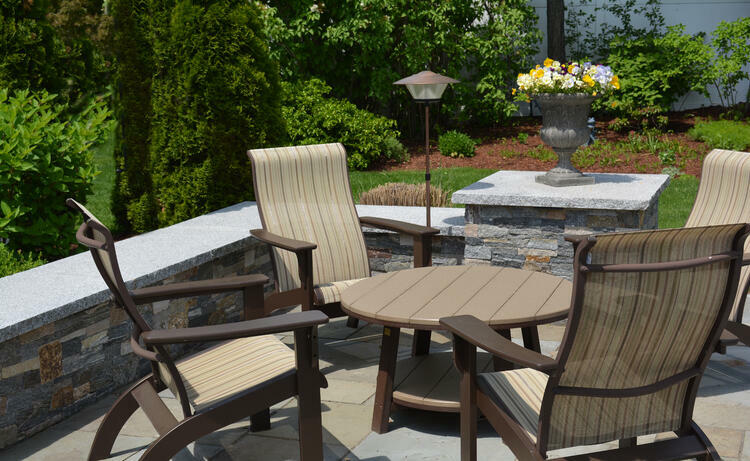 Comfortable outdoor furniture is critical in designing a livable and inviting outdoor space. 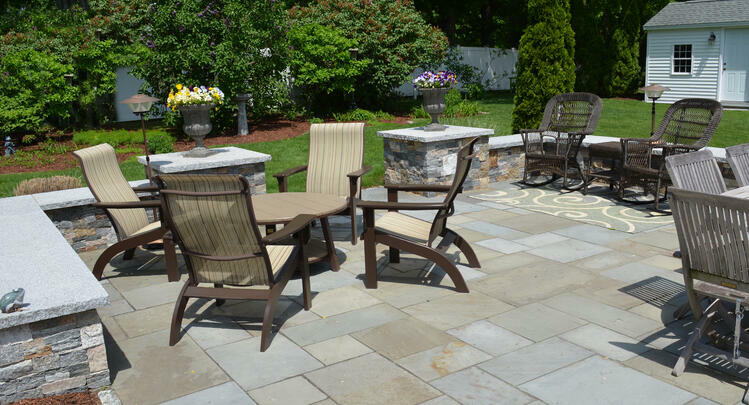 Accentuate your granite patio with wood furniture and comfortable pillows and cushions. For a vibrant spring or summer look, choose bright colors like Pantone’s Color of the Year, Living Coral, to complement the space. Bright pops of turquoise outdoor furniture accentuate the pool and stone patio at this Cohasset, Massachusetts estate. 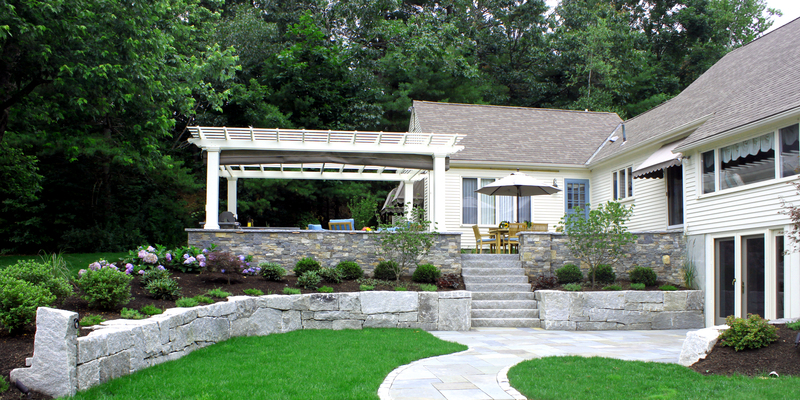 The stone walls are made of New England fieldstone, the pool coping and decking are bluestone, and steps are Woodbury Gray granite. Project by Sean Papich Landscape Architecture and Seoane Landscape Design. Comfortable cushions and furniture make this cozy outdoor fireplace even more inviting. The fireplace features Back Meadow Fieldstone with a bluestone hearth and mantel. If beauty and durability are equally important to homeowners, granite benches are an excellent option. 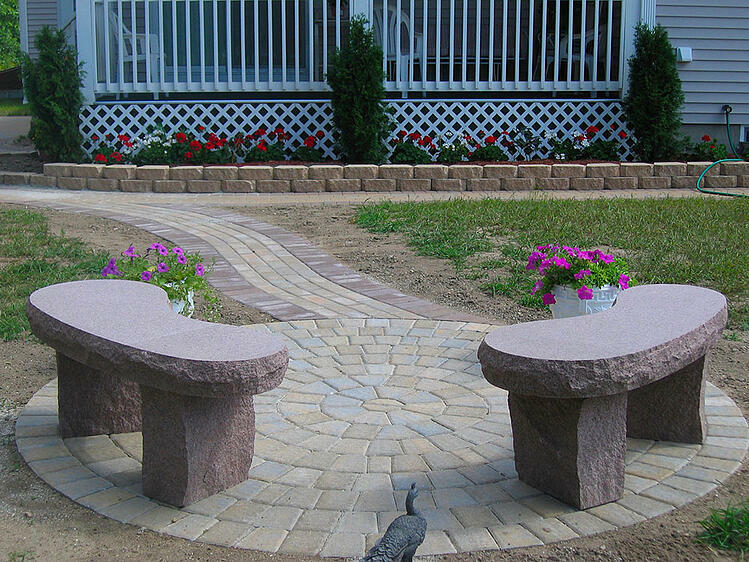 Granite benches can take your backyard to the next level by providing a seating space that complements surrounding hardscape and softscape. Autumn Pink granite standard style kidney benches add structure and color to this circular patio. Few outdoor elements relieve stress and tension like the sight and sound of gently flowing water. Water features add an unmatched element of relaxation and rejuvenation to any outdoor area and can accommodate a wide range of budgets and backyard layouts. “Keep it simple with a tabletop fountain or get more elaborate with a professionally installed bubbling stream at the patio’s edge,” DIY Network recommends. 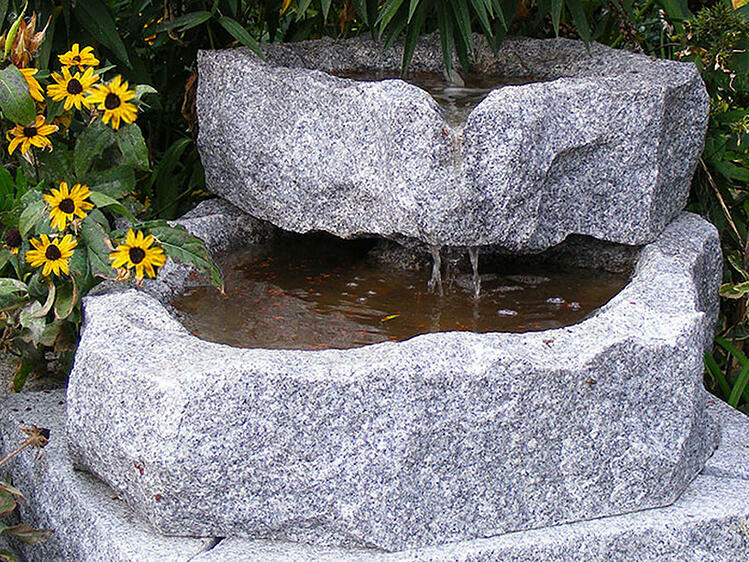 Beauty lies in the simplicity of this Swenson 2-tier granite fountain, which can be ordered in five granite colors. No plumbing is required for this fountain, which recirculates the water it is filled with. Electricity is needed for the fountain pump. Running water creates a peaceful and lush atmosphere with this Woodbury Gray granite spillway on a weathered fieldstone wall. Project by See Level Landscape Design. If the term “outdoor play space” conjures up visions of treehouses and playgrounds, think again. From bocce ball courts to lawn space for outdoor games, a livable backyard creates playful settings for adults and children alike that are as beautiful as they are fun. 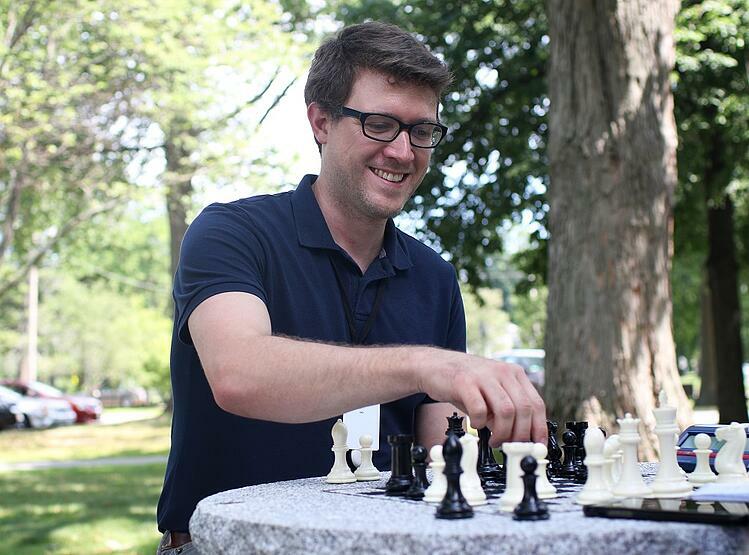 A granite chess table and benches create an elegant yet functional game area, as exemplified by the handcrafted pieces by Swenson Granite Works outside the Peabody Institute Library of Danvers in Massachusetts. The set was donated by the Rotary Club of Danvers. 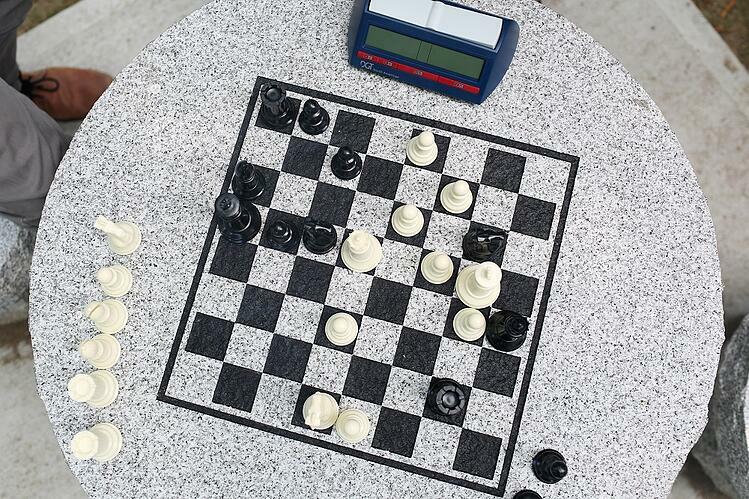 Library visitors enjoy the handcrafted granite chess table and benches by Swenson Granite Works. A fire pit or fireplace can bring lasting warmth to an outdoor area. From early spring to late fall, this backyard centerpiece can be enjoyed with friends and family throughout the year. Choosing the right location is critical during the first steps of planning for a fireplace or fire pit. “You’ll want to ensure that it’s a fairly open space, free and clear of overhanging obstacles like tree branches or shrubs,” says HGTV. As with any fire, safety is critical—do not install it near any flammable plants or materials, and be sure to keep a water source nearby. Fire pits come in a wide range of materials and design styles, but granite is a popular option for its appearance and durability. Depending on the difficulty of installation, you can choose to either have the fire pit installed by a contractor, or you can purchase a fire pit and install it yourself. A fire pit made of Ticonderoga granite thin wallstone thin weathered fieldstone with a rock faced Woodbury Gray granite cap becomes the geometric focal point of this welcoming patio. Thin weathered fieldstone, Woodbury Gray granite split face steps, and thermal bluestone patio pavers balance both structured and natural elements. Project by MDM Construction Management. 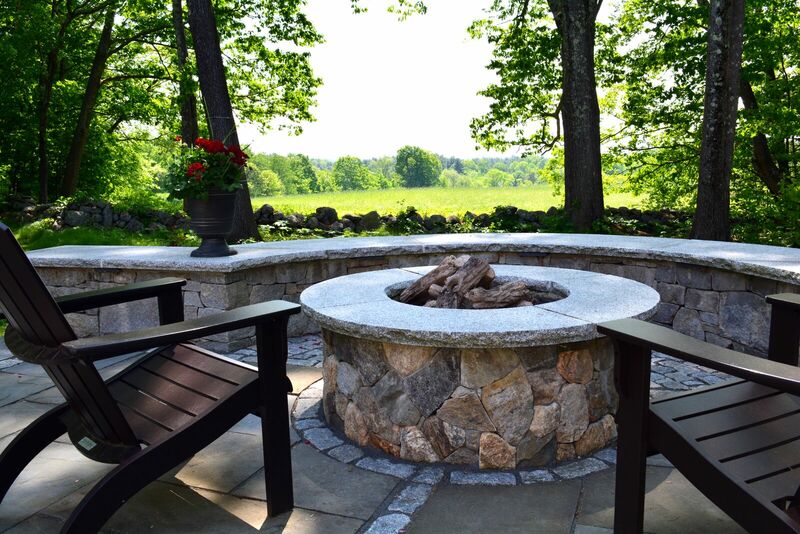 A fire pit completes a quaint seating area among this lush landscape. The fire pit features a Woodbury Gray granite fire pit cap, thermal top with rock face edges, standard cobblestones, and Boston Blend mosaic thin veneer. The patio is constructed of full color natural cleft bluestone pavers, a Woodbury Gray granite wall cap, thermal top with rock face edges. Project by Northern Lights Landscaping Contractors. A great option for installing a fire pit yourself is Swenson’s DIY fire pit kit, which is easy to assemble and can be installed in a matter of hours from start to finish. 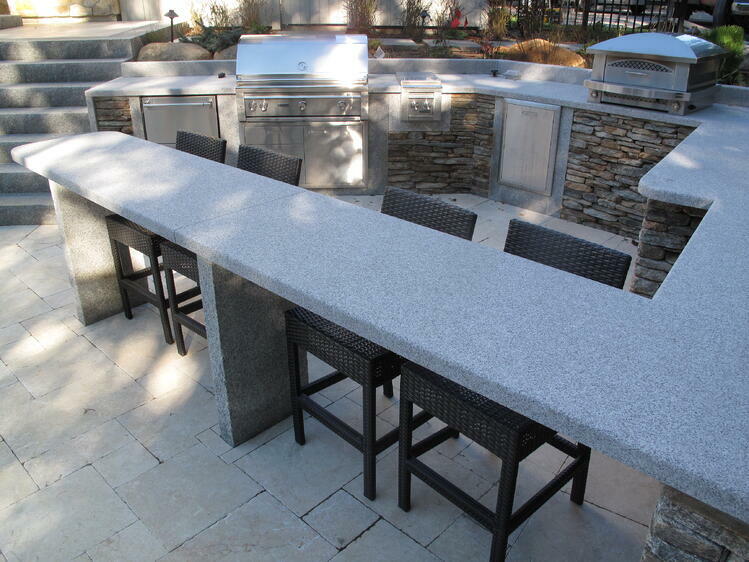 Constructed of Woodbury Gray granite or six other granite colors available by special order, it provides a beautiful and durable option that will last for years to come. 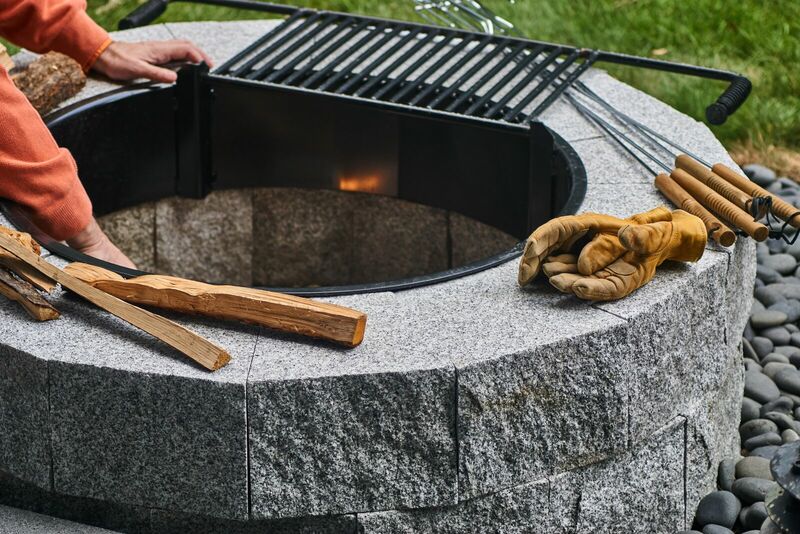 Swenson’s DIY fire pit includes a 30” diameter cast iron ring and tilt back cooking grate. The fire pit is available in 1-tier, 2-tier, or 3-tier options. Project by Jeremi Bigosiński, Form Plus Matter. 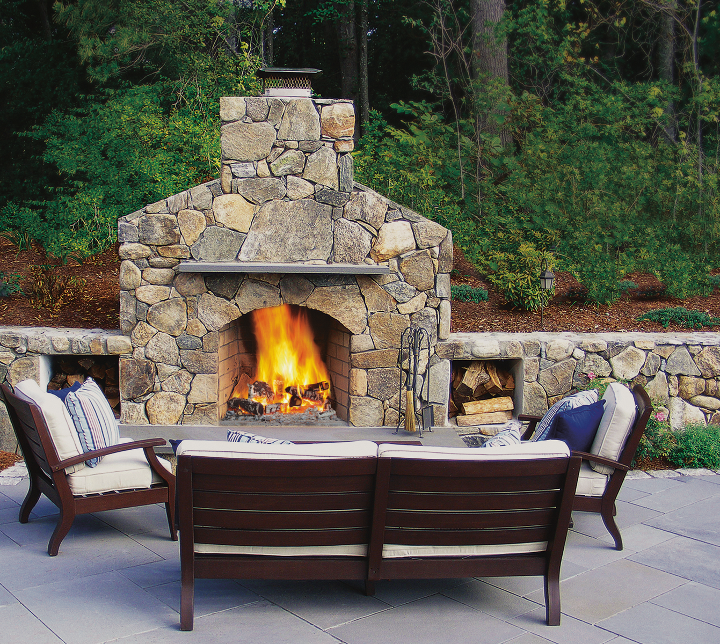 Sheri Sanzone of landscape architecture firm Bluegreen recommends that all homeowners have a clear vision of how they would like to use an outdoor fireplace before beginning the design process. “Yes, it’s visual and aesthetic, but fire needs to serve a purpose,” Sanzone said. The functional use for the fireplace, whether as a quiet place to relax at the end of the day, or as a lively gathering place for large parties, should determine its design. Natural stone is by far the best option to construct an outdoor fireplace, in terms of aesthetics and durability. A natural stone fireplace will hold up well to harsh elements where other materials will not. Stone veneer paired with a mantel and hearth made of either granite or bluestone creates a beautiful and long-lasting combination. A natural stone fireplace completes a spacious patio, making a cozy yet elegant area for larger gatherings. The outdoor fireplace here features a Woodbury Gray granite hearth and mantel. Woodbury Gray granite split face steps go from patio to pool and the retaining wall is constructed of New England Style wallstone. Project by Seoane Landscape Design. To discover how Swenson Granite Works can help you transform your backyard into a livable outdoor retreat with an outdoor fireplace, download the Heart of Home Inspiration Guide.